Cheapass Games have partnered with author Patrick Rothfuss to bring board games from his Kingkiller Chronicles fantasy series to life. It was midday. The Fun Local Game Store lay in silence, and it was a silence of three parts. The most obvious part was a hollow, echoing tapping, made by stones that were clacking. Inside the Store, a pair of men huddled in one corner over a checkered game board. They played with quiet determination; in doing this they added a small, sullen silence to the larger, hollow one - except when they were talking or laughing, because they were having a pretty good time, actually. The men are playing Tak, the same game that Kvothe falls in love with in Patrick Rothfuss' The Wise Man's Fear. 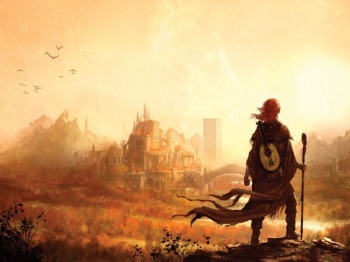 That book and its predecessor, The Name of the Wind, are two wildly popular fantasy novels that follow Kvothe's life from young trouper to university keener to... well, we're still waiting on that third book. A Kickstarter campaign last year brought Pairs to life - another game from the series' "Four Corners of Civilization." An easy-to-learn card game to be played in pubs and taverns, crowd-funding brought Cheapass Games' project over 300,000$; with great financing, however, comes great responsibility, and one stretch goal had Patrick Rothfuss and James Ernest promise to create rules for Tak. 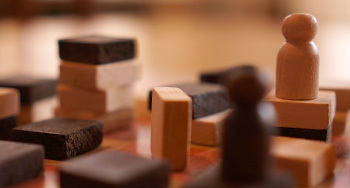 Tak is played with stones on a board; it's a little bit chess, a little bit go. In the novel, Pat (also of Worldbuilders) keeps the game's rules vague, but Cheapass Games has thrown back the shaed and presents the rulebook free for all to download. All you need is a checkers set to play. "Some expert mathematicians and strategy game players are already trying to break this game," announces the website. "So far, it's held up pretty well." Still, gamers of all types are welcome to try it for themselves, and report back. The rules will leave beta in February of 2016, and a Kickstarter campaign will follow. Pairs, meanwhile, is really taking off. A variety of themed decks exist and appeal to any number of players - Fruits; Barmaids; Pirates. Even that one man penny dreadful, the marvelous, the eccentric, Professor Elemental, has a deck devoted to his steampunk hip-hoppery. Similarly, The Witcher's Gwent is developing a life of its own outside the video game. Oh, and that third silence I mentioned? Well, it was not an easy thing to notice. It was in the furrowed brow of a man at the table. The board game was his, just as the third silence was his. It was deep and wide as a game of Mage Knight. It was heavy as Arkham Horror. It was the grumbling, cut-it-out sound of a man who is about to lose. For, like, the sixth time in a row.